Fring, the popular free mobile phone application that allows users to make free VOIP calls and chat with contacts of popular instant messengers, is available for iPhone now. My favourite feature of Fring is its ability to allow us to use Skype on mobiles. I’m using Fring on my Nokia mobile for two past years and able to make make free Skype calls ( and Skype out calls) to my friends who uses Skype. Apart from supporting Skype on mobiles, Fring also allows us to chat with buddies of GTalk, Yahoo, MSN, ICQ and AIM. 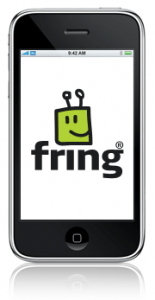 Fring puts all the buddies in to single list and lets us know their status(online, away or busy). Fring is available for jailbroken iPhones since the first quarter of 2008 and now it is officially available for all iPhones at Apple App Store. If you looking for a free multi-messenger chat client and free VOIP application for your mobile, then Fring is the right software. iPhone is late on this one, VOIP has been here a long time.